Dropbox, Inc. (NASDAQ:DBX) investors should pay attention to an increase in hedge fund sentiment recently. 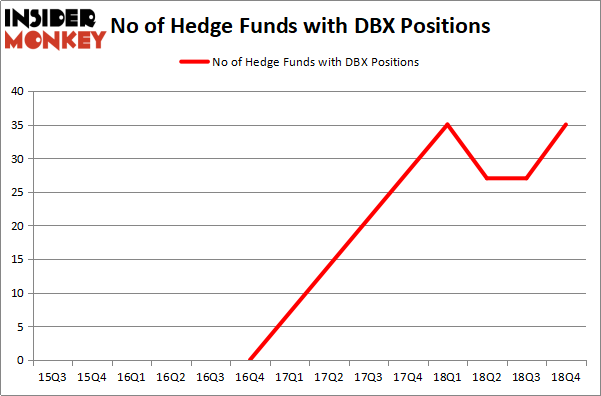 Our calculations also showed that DBX isn’t among the 30 most popular stocks among hedge funds. We’re going to take a look at the recent hedge fund action surrounding Dropbox, Inc. (NASDAQ:DBX). Heading into the first quarter of 2019, a total of 35 of the hedge funds tracked by Insider Monkey were bullish on this stock, a change of 30% from one quarter earlier. By comparison, 35 hedge funds held shares or bullish call options in DBX a year ago. With the smart money’s sentiment swirling, there exists a few notable hedge fund managers who were adding to their holdings significantly (or already accumulated large positions). The largest stake in Dropbox, Inc. (NASDAQ:DBX) was held by Hunt Lane Capital, which reported holding $72.5 million worth of stock at the end of September. It was followed by Holocene Advisors with a $54.4 million position. Other investors bullish on the company included Polar Capital, Valiant Capital, and Partner Fund Management. As aggregate interest increased, key money managers have been driving this bullishness. Holocene Advisors, managed by Brandon Haley, established the most outsized position in Dropbox, Inc. (NASDAQ:DBX). Holocene Advisors had $54.4 million invested in the company at the end of the quarter. Marcelo Desio’s Lucha Capital Management also made a $18.7 million investment in the stock during the quarter. The other funds with new positions in the stock are Joseph A. Jolson’s Harvest Capital Strategies, Matthew Hulsizer’s PEAK6 Capital Management, and Matthew Tewksbury’s Stevens Capital Management. Let’s now review hedge fund activity in other stocks – not necessarily in the same industry as Dropbox, Inc. (NASDAQ:DBX) but similarly valued. We will take a look at Nielsen Holdings plc (NYSE:NLSN), DENTSPLY SIRONA Inc. (NASDAQ:XRAY), Tata Motors Limited (NYSE:TTM), and Trimble Inc. (NASDAQ:TRMB). This group of stocks’ market caps match DBX’s market cap. As you can see these stocks had an average of 22 hedge funds with bullish positions and the average amount invested in these stocks was $828 million. That figure was $407 million in DBX’s case. Nielsen Holdings plc (NYSE:NLSN) is the most popular stock in this table. On the other hand Tata Motors Limited (NYSE:TTM) is the least popular one with only 9 bullish hedge fund positions. Dropbox, Inc. (NASDAQ:DBX) is not the most popular stock in this group but hedge fund interest is still above average. This is a slightly positive signal but we’d rather spend our time researching stocks that hedge funds are piling on. Our calculations showed that top 15 most popular stocks among hedge funds returned 21.3% through April 8th and outperformed the S&P 500 ETF (SPY) by more than 5 percentage points. Unfortunately DBX wasn’t in this group. Hedge funds that bet on DBX were disappointed as the stock returned 8.4% and underperformed the market. If you are interested in investing in large cap stocks, you should check out the top 15 hedge fund stocks as 12 of these outperformed the market.